We hope to assist you in planning an amazing ceremony for your special day. A ceremony that will reflect who you are as a couple and capture the joy and celebration of the occasion without sacrificing the meaning and significance of that special moment. 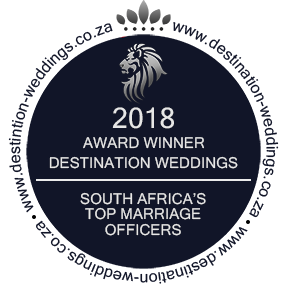 We are marriage officers based in Cape Town, South Africa and licensed with the Department of Home Affairs to conduct all types of marriage ceremonies. We will provide a tailor-made ceremony, prepared in consultation with your needs, style, personality and dreams. Our specialty is in assisting overseas couples to marry in Cape Town. With the huge variety of choice in terms of venues and locations, the sky is the limit. We have been market leaders since 1996 and have in excess of 4000 happy couples to our credit. From the bottom of our hearts, Tim and I would like to thank you so much for putting together one of the most beautiful ceremonies that most people (Tim and I included) have ever experienced. From your words to your presence, it was absolutely amazing! Every single guest came up to us to ask who you were as you were brilliant! Thank you again so much! Thank you so much Andred for making our wedding such an amazing day! The ceremony was absolutely perfect!! Despite the challenge of our differing backgrounds and faiths, we really felt like you captured our love for each other! From the first meeting with you, we were so impressed. Our families and friends continue to talk about how special it was and how moved they were by your sermon. It was so special that you were able to meet with us ahead of time and take away all our worries about our ceremony. We really felt comfortable with you from the get go. I do Weddings are proud of their excellent reputation in providing meaningful and professional service to couples from all around the world for the last 23 years. Andred and Alison Hayward have more than 30 years experience in conducting wedding ceremonies. They conduct marriages locally and internationally.